As with Luc Ferrari, it is an assemblage of recorded sequences in which we recognize a succession of various events and we reconstruct in our imaginary a possible narrative that may have been at the origin of these sounds. This is not the sound landscape (Soundscape or Field recording) whose neutrality of the author must be one of the characteristics. It is not reportage. Above all, it involves the assembly, by montage and superposition, of sounds of different origins with the intention of composing a musical continuity which can be assimilated to a kind of sonorous narrative. In any case, it is the listener who has to construct his own story based on his recognition of the sources, or according to his interpretation of these sources. The composer organizes the different sounds, puts them in relation, creating associations but also contradictions in the mind of the listener. 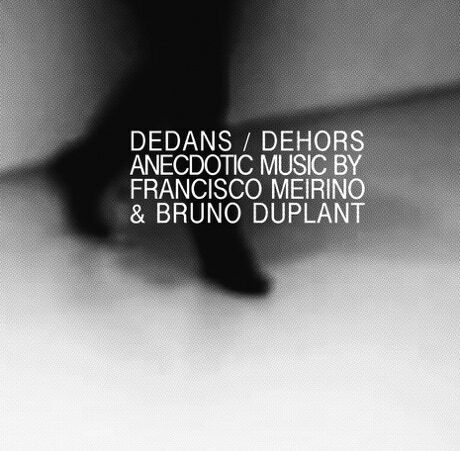 Francisco Meirino & Bruno Duplant show love for their surroundings with the dreamy field recordings of “Dedans / Dehors”. Staying true to the unique vision of Luc Ferrari, they acknowledge that music surrounds. They ensure this template is strictly adhered to by sculpting the real with the imagined and manipulated. A playful quality informs the entirety of the album for the journey traverses such a wide terrain. Mere snippets of vocals, the speeding up and slowing down of it all, lends the pieces a hypnotic almost tribal-like quality to it. Nothing remains constant they embrace flux and make it an important ally in the three extended takes. “Dedans” features only a single constant element, a little ring. Beyond this, everything else is allowed to roam completely free. Utilizing this anchor helps center the piece which otherwise would easily drift off into a vast space. Audience noise begins “Interstice” giving it a particularly humorous introduction. From there the duo allow it to wander about, with a loose quality coming to define it. Static comes into the fray and indeed becomes one of the main focal points of the composition. By far the highlight comes from the finale, the spirited performance of “Dehors”. Hard to precisely pin down, the piece features a maddening array of manipulations. Hyperactivity reigns supreme as every single moment opts for exploring so many divergent paths. We have here the collaboration between two active forces from the world of field recordings and electronics. Francisco Meirino appears a little less active these days when it comes to releases, but he’s still interested in everything that falls apart yet can still be captured on tape, from broken equipment to background hiss and Bruno Duplant not only uses field recordings, but also instruments such as double bass, percussion, organ and electronics. On their work together they use field recordings and all sorts of on site captured electronics. In the press text they tell us about all things Luc Ferrari, montage, superimposition but the bottom line is “in any case, it is the listener who has to construct his own story based on his recognition of the sources, or according to his interpretation of these sources.” I must admit that is not always the way I approach such things, thinking about recognition of sources or constructing stories. I hear people talking in French (Meirino comes from Switzerland, Duplant from France), there is a bunch of recordings which I find very hard to locate anyway, there is a bit of piano, lots of faulty lines in the electrical department, and sudden, abrupt starts and stops, the ever present montage techniques of layering unrelated sounds together. There is quite a radical approach to some of this music, with some extreme frequencies filtered right up in the music, which I think is very much Meirino’s interest. What this is about then for me? I have no idea, but as said that is perhaps not how I approach music per se, as a narrative or not; for me music like this is more about the quality and the beauty of the sound and how these are put together. Do I hear something of beauty? Is it something that can hold my attention, or puts me otherwise in another mood (not necessarily relaxed)? Those are the questions I (also) consider and in this case I must say I rather enjoy what I hear. There is an excellent quality to the sounds and it is put together in a great way, very imaginative and very much part of the French history of musique concrete and as such they are excellent successors to the work of Luc Ferrari.